Today Sam trusted me to rummage through his tools and be let loose in the poly-tunnel on my own as he isn’t on site today. 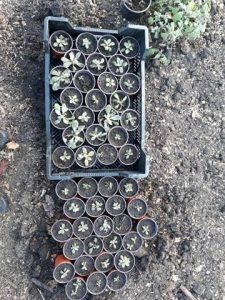 Remarkably I didn’t manage to break anything or stab myself with a fork, but I did manage to pot up 48 seedlings (he told me there were 25!! ) 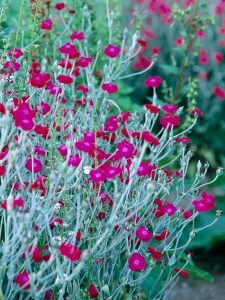 that I think are Rose Campion but not sure…. so they’ll look like this eventually….I think. I may have it terribly wrong. 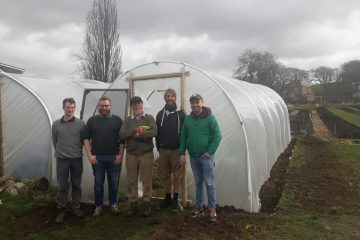 I realise this isn’t breaking news, but the point of this post is how much I enjoyed being in the poly-tunnel with the sound of the rain and wind, inside in the calm and warmth with my hands in the soil. It really is quite lovely. Apparently I’ll be getting my own, smaller poly-tunnel at some point to grow chilli peppers in and I actually can’t wait. Please do come and say hello on a Friday, one of us is always pottering about somewhere. Or come and help out, just drop us a line.